delicious meal that's ready in less than 30 minutes! Happy Monday, my friends! For many of us whose kids were on spring break last week, today we are getting back to the grind. Back to school, back to work, and back to our old routines. It's hard to get back into the swing of things after a week of relaxation, but a girls' gotta do what a girls' gotta do. Amiright? 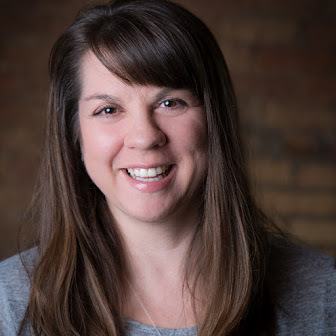 To kick things off this week, today I'm sharing with you one of my favorite quick and easy weeknight meals. 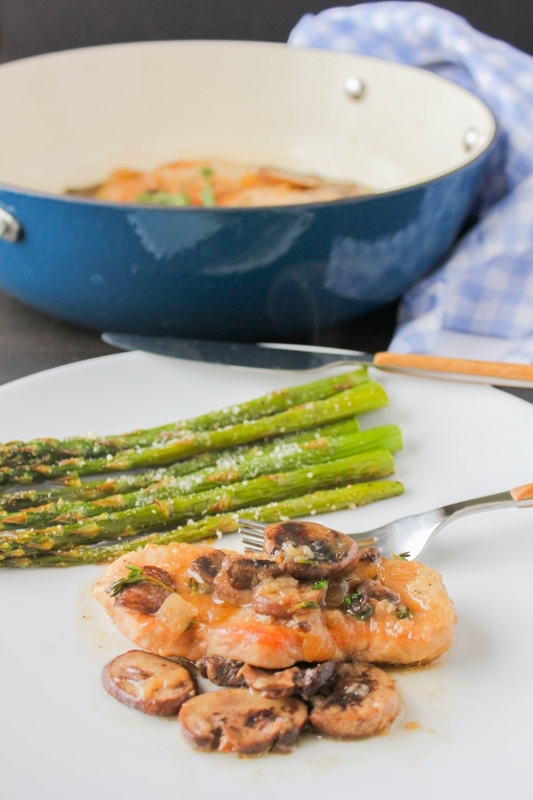 This Skillet Pork Marsala is a one pan wonder and comes together in about 20 minutes. Served with a side of fresh Roasted Asparagus, you've got a nutritious dinner to feed the family when they get home tonight. 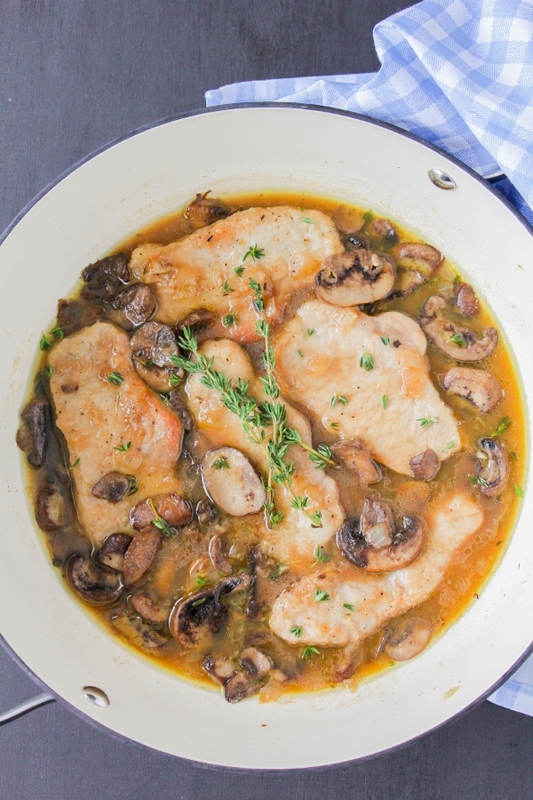 Many of you have heard of, and probably eaten, chicken marsala, but have you ever tried it with pork? 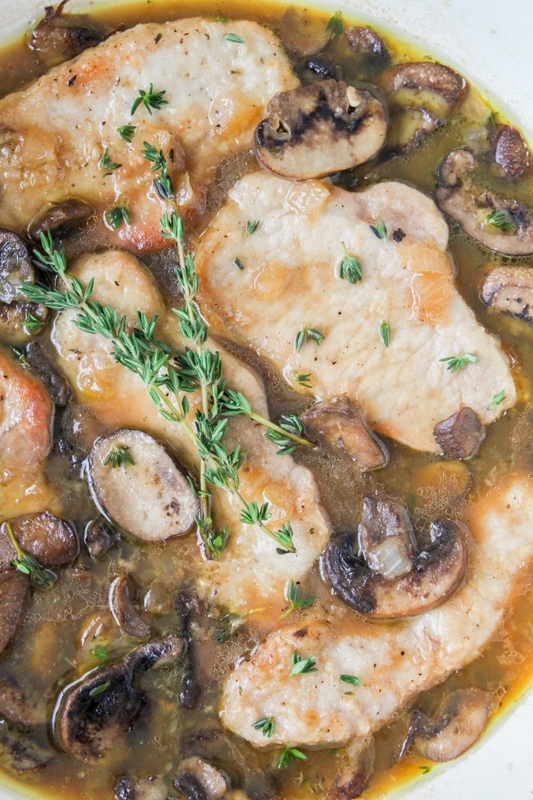 I was looking for ways to change up and elevate our every day meals and this pork marsala was born. 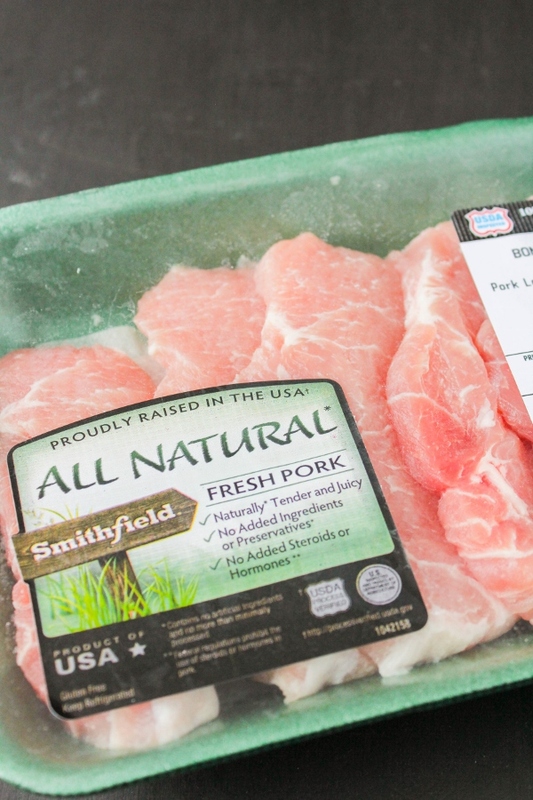 I like to use Smithfield All Natural Boneless Pork Chops because they are tender and juicy without added steroids, hormones or artificial ingredients. Their high quality products are versatile enough for easy weeknight cooking, as well as weekend entertaining. For the dish everything cooks in one pan for less mess and easy clean up, and it's ready in no time. Quick weeknight meals are what we need more of! Smithfield's All Natural line also includes Bone-In Pork Chops, Back Ribs, Pork Tenderloin, Boneless Loin Filet, and Shoulder Roast. The recipe options are endless! Are you ready to try this recipe for yourself? 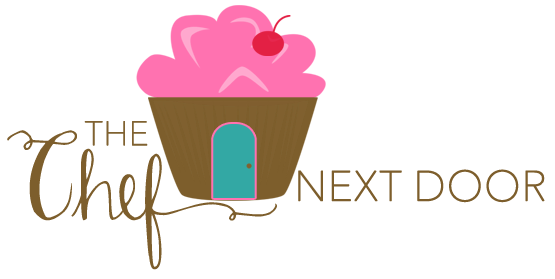 Grab a $1.00 coupon to get started! In a shallow bowl, add the flour, garlic powder, salt, pepper, and dried thyme. Mix to combine. Add the pork chops to the mixture, one at a time, coating all sides. Tap off any excess. In a large skillet, add the butter and oil over medium high heat. When the butter is melted, add the pork chops. Cook the pork chops until golden brown, then flip and cook until the other side is golden brown. Remove the pork chops from the pan to a plate and set aside. With the heat on medium, add the onion, mushrooms and garlic to the pan. Allow them just to soften, about 5 minutes, then add the marsala and chicken broth. Use a wooden spoon to scrape up any bits from the bottom of the pan. Allow the mixture to come to a boil then nestle the pork chops and their juices in the sauce. Cover the skillet, turn the heat down to a simmer, and let cook for about 8 minutes. Place the pork chops on individual plates. Top each with some mushrooms and sauce and serve with the roasted asparagus. **While the pork chops are cooking, prepare the asparagus. Lay the asparagus on a large sheet pan in one layer. Drizzle the olive oil over the top and toss to make sure all the pieces are coated. Sprinkle with salt and pepper. Roast in the oven for about 12 minutes, until the asparagus is tender. Sprinkle with the Parmesan cheese and place back in the oven until it melts. Check out this video and get another recipe for Smithfield Maple Chipotle Glazed Pork Chops! 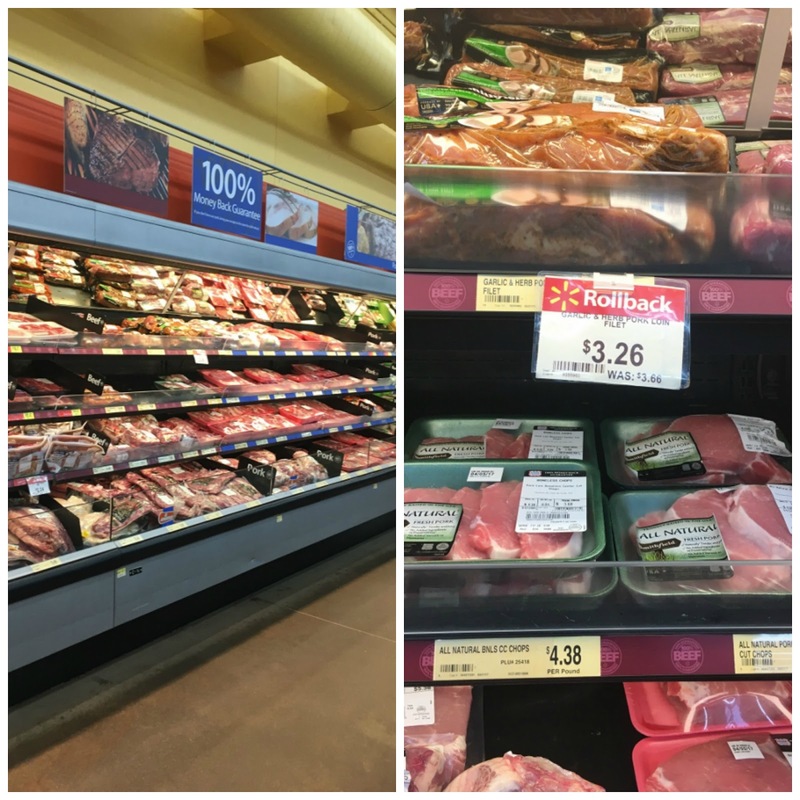 Find Smithfield All Natural Pork products at your local Walmart store!